We are pleased to announce a brand new full length MyOneManBand album, set to explore a whole new level of improvised live electronic performance. A self collaboration with his noise minimalist alter-ego BlackFace brings you two individual albums, each with their own story, but which can also be mixed (via two separate CD players or media players), for a listening experience that will be unique every time. 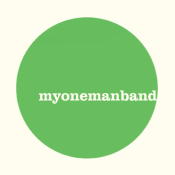 The fully-improvised debut live album by Hull-born, Antwerp-based electronic musician MyOneManBand is available as a pay-what-you-like download from today, 1st May 2013. 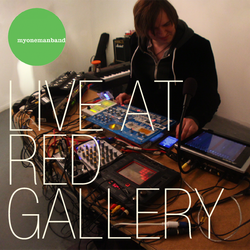 The six-track live album was recorded in one take in the intimate surroundings of Hull's RED Gallery of Contemporary Art on 5th April 2013. Composed on the spot using electronic hardware, IOS devices and the live sampling of household objects and audience interactions, the album is a unique document of the performance as it was experienced by the audience on the evening.